Kholodets is one of those recipes that sounds really weird, but it’s actually not too weird when you think about it: it is simply bone broth poured over shredded meat, then allowed to cool so it’s gelatinous. Then, you spoon it out and eat it with mustard or horseradish mayonnaise. Meat Jello? 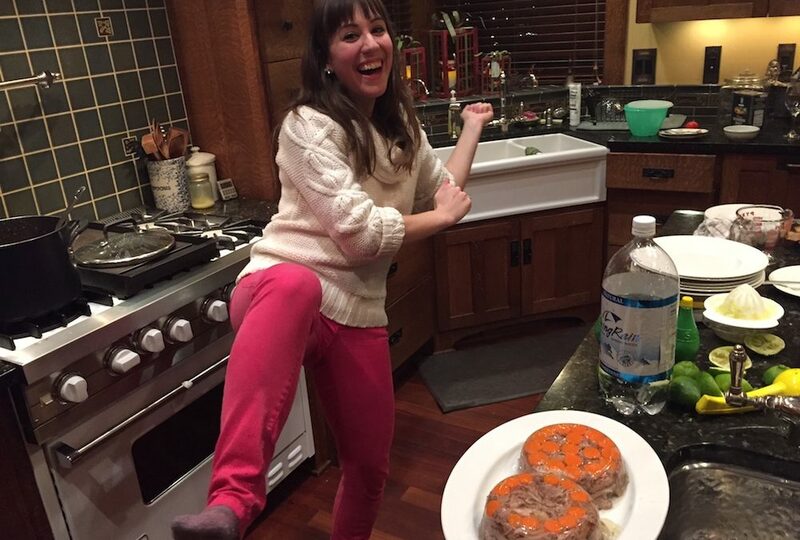 Yes, okay, meat jello. That sounds weird, BUT there was a time when it was quite normal to eat this gut-healing, nutrient-rich dish here in the US of A! Have you heard of aspic? Kholodets is basically the Ukrainian version of that. I tried it for the first time a few years ago while visiting the family of my Russian boyfriend at the time, loved it, and then learned how to make it myself while I was in Ukraine two years ago. I recently made it again all by myself with no help at all… Okay, that’s a lie. There was a lot of handholding by the lovely folks at Blue Valley Meats (whom I recommend highly if you are in Washington State!). They were great about answering all my questions about the types of bones and meats I should get to ensure a really gelatinous and flavorful broth. You will probably need to special order at least some of these meats from a butcher, since there are some odd bits that (sadly) seem to have fallen out of favor with the public these days: a shame, because these parts are rich in collagen and gelatin, which does awesome stuff: it keeps your skin plump and wrinkle-free, keeps your joints moving smoothly, and helps build and strengthen your bones, gut lining, hair, skin, and fingernails. But I digress. As always, make sure you trust your supplier and get meat from properly raised animals eating their natural diet (e.g. grass-fed beef). Divide the bones and meat between the two pots, tying to keep the amounts of meats and bones in each of the pots even. Fill up the pots just enough to cover the bones. Bring the pots to a rolling boil, and then turn off the heat. Dump out the water. This step will get rid of impurities in the bones and will ensure a clearer broth. Fill up the pots again, just enough to cover the bones. Add 1/4 cup chopped apple cider vinegar to each pot. Bring it to a simmer and skim off the scum that floats to the top. Reduce the heat to low and cover the pots. You want it to simmer on very low heat — like, just a couple bubbles every second — for a very long time (from 24 up to 72 hours; I did mine for 48). This and the ACV is going to help extract all that healing gelatin and rich minerals from the bones. Six hours before the broth is going to be done, add two onions, two carrots, one stalk of celery, and two bay leaves to each pot. Once the broth is done, turn off the heat. With a slotted spoon, take out the contents, leaving just the broth in the pots. Set the meats, meaty bones, and carrots in a bowl to cool slightly. (The other veggies, bones, and chicken feet can be thrown out or composted as you desire.) Strain the broth through the strainer, lined with a paper towel, into the large glass jars or glass bowls. The paper towel will catch the last remaining gunky bits so you get a really clear broth. If you can fit all of the broth into one stockpot (make sure you clean it first), consolidate it and add the minced garlic, salt and pepper. Otherwise, just divide the broth evenly between the two pots and add half of the mixed garlic to each of the pots. Using your hands, pick apart the meat and separate the good pulled meat from the bones. Discard the bones. Ladle the broth over the meat, filling up the containers, stirring the broth in the pot as you go as you go so all the garlic doesn’t settle to the bottom. Put the containers in the fridge and allow them to cool overnight until they are set. If you want to serve it and make it look fancy, invert the container onto a serving platter. You may have to run the container under some hot water (with the lid on tightly, of course) to loosen it a little. Otherwise, you can scoop it directly from the dish onto the plate. And then do a little kholodets dance. All that hard work paid off and you’re finished! You can garnish with a sprig of dill to make it pretty. Eat it with a dollop of good quality mustard or horseradish mayonnaise (or both, if you’re as crazy as I am!). Like I said: a lot of work, but fun for a special occasion, and full of nutrients for building strong, healthy bodies! 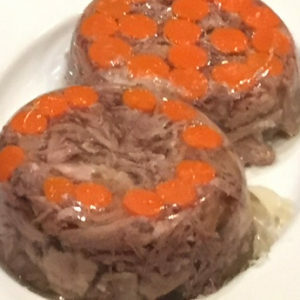 "Kholodets" (Холодец) is basically the Ukrainian version of aspic, made with bone broth poured over shredded meat, then allowed to cool so it’s gelatinous. Fill up the pots again, just enough to cover the bones. Add 1/4 cup chopped apple cider vinegar to each pot. Bring it to a simmer and skim off the scum that floats to the top. Reduce the heat to low and cover the pots. You want it to simmer on very low heat―like, just a couple bubbles every second―for a very long time (from 24 up to 72 hours; I did mine for 48). This and the ACV is going to help extract all that healing gelatin and rich minerals from the bones. Ladle the broth over the meat, filling up the containers, stirring the broth in the pot as you go as you go so all the garlic doesn't settle to the bottom. And then do a little kholodets dance. All that hard work paid off and you're finished! You can garnish with a sprig of dill to make it pretty. Eat it with a dollop of good quality mustard or horseradish mayonnaise (or both, if you're as crazy as I am!). Great recipe. I wonder if the slow Cooker could be used instead of the stove. I’m sure you could! I’ve used the Instant Pot (pressure cooker) to do the last step and it works like a charm, too. You could probably just use the slow cooker’s high setting for 2-3 hours. If it goes too long, they might get kind of crumbly and fall apart, but you could try!